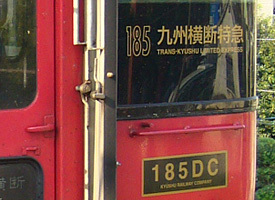 Railway car designs and Letters. 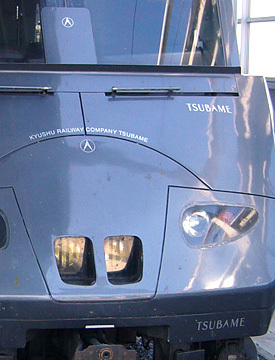 If you were a train geek and want to come to Japan, I do recommend you go to Kyushu island, in southwest part of Japan. 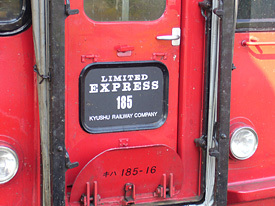 If you were a typeface and letter geek, Kyushu is worth visiting to check railway designs. 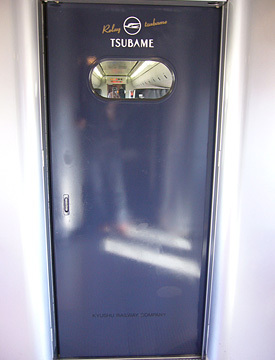 Eiji Mitooka is the most famous train car designer in Japan. Japanese broad casting company TBS (Tokyo Broadcasting System) run the program featured Mitooka last night, I’ve enjoyed to watch it. I had been in Kyushu area several times. 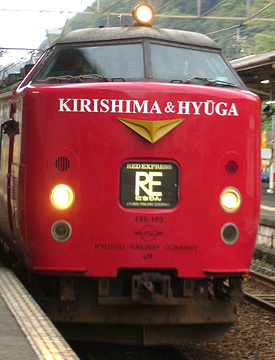 The one of the times was about four years ago to research the Hisatsu Orange Railway, which runs southwest coast in Kyushu island, and the last time was in last October to trip across Kyushu. Anywhere I would like to go to, I went to there mostly by train. 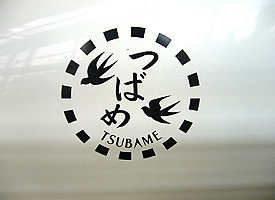 The limited express trains designed by Mitooka such as Kamome, means gull, Sonic, Yufuin no Mori (Forrest in Yufuin) and Kyushu Shinkansen ballet train named Tsubame means swallow, are running across the Kyuhsu island. Not only the limited expresses, but also commuter trains and the one runs across rural area were very cool and unique. 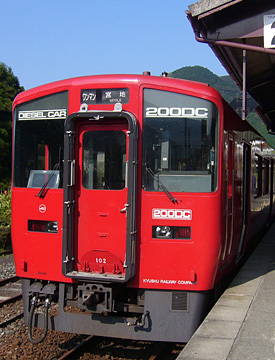 When I was waiting for the next train was coming to the station in rural area, I was astonished that a strong red colored and unique graphic designed train was coming to the station. I thought they looked like European style train cars. 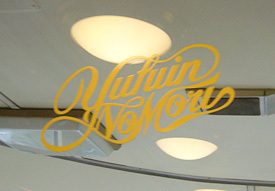 The logotypes and typographies of the designs were also great and I was always excited to see them during my trip. 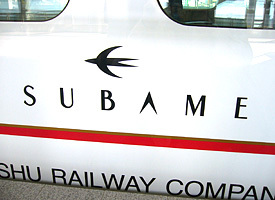 Above: Kyushu Shinkansen ballet train Tsubame. The logos are very cute. “つばめ” means swallows. 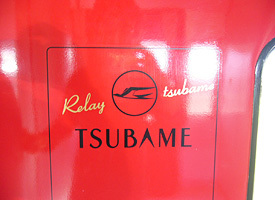 Relay Tsubame runs between Hakata and Shin-Yatsushiro, where is still under construction Kyushu ballet train line. 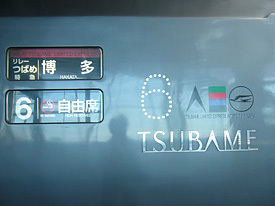 Relay Tsubame connects to Kyushu Shinkansen. 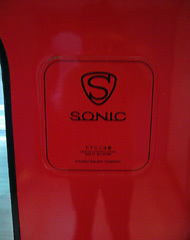 Sonic series Nichirin Right above: The symbol mark comes from the design of the head rest of the passenger seat. 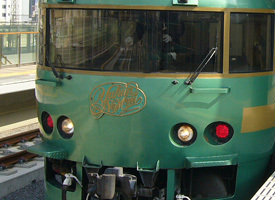 Above: The sightseeing limited express, Yufuin no Mori. 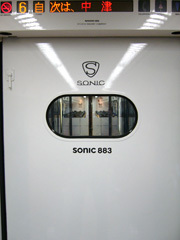 Right: The script logo decal on the partition window between the passenger area and the cockpit. 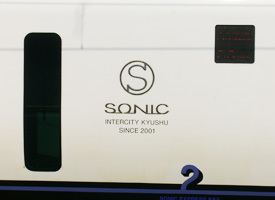 The limited express across Kyushu. 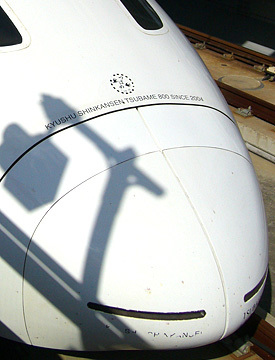 The trains run through the Aso volcano area between Kumamoto and Beppu (Oita pref.) 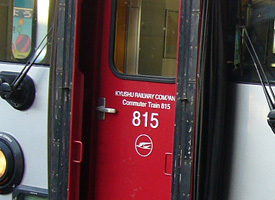 The line contains switchback system. 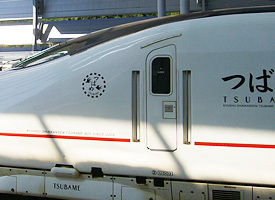 The commuter trains are also unique and have urbanized design. 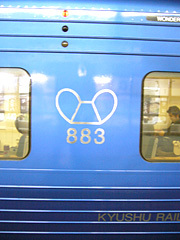 JR group often uses Helvetica to show car numbers. However, Mitooka designs them like a numbering of the Robot Hero Gundum. After starting my design office last year, my former-supervisor in Osaka introduced me to Mitooka, I had a chance to visit Mitooka’s office in Itabashi Ward, Tokyo. He talked about some stories and episodes of his works for over two hours. 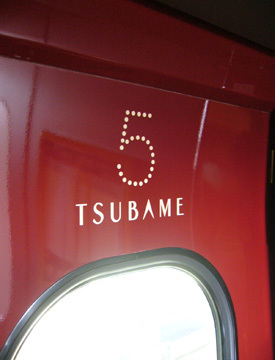 ‘I always couldn’t get enough budget to design these logotypes and graphic designs for the train. Mostly of the logo designs were voluntary works,’ Mitooka said. 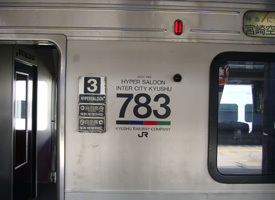 ‘I think it is very important to design logos and to design the layout of letters because train cars definitely need letters and numbers to show the train’s name and car number signs’, he continued. Indeed, as he mentioned above, he did the best job to design letters and numbers even if they are in a hidden place. 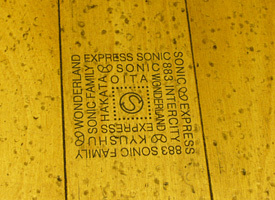 Besides, Mitooka always takes care of the design so that children can enjoy to see and to get on trains. In the TV program, he explained the chair he designed that this is the one I wanted (when I was a child). He is always considering designs for children. When I was child I used to draw trains that run nearby my home town. I loved to see trains and wanted to become a designer for trains. However, I’m a type designer now. I still hope to work for the project for designing trains or railway signs from the viewpoint of a typeface designer in future. Recommend book. amazon.co.jp, Japanese only. 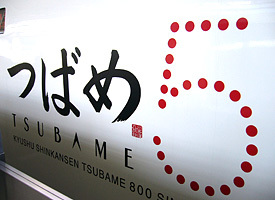 『ぼくは「つばめ」のデザイナー—九州新幹線800系誕生物語』”Boku wa Tsubame no Designer”, means “I’m a designer of Shunkansen Tsubame”, Kyushu Shinkansen Design Story. 水戸岡鋭治著 Author: Eiji Mitooka.